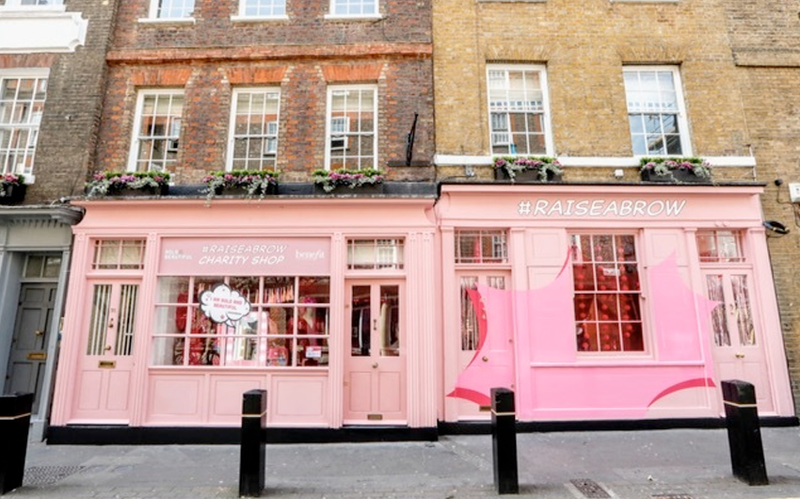 Benefit has set up an all-pink charity shop in London! Everything inside is totally pink, donated by brands and influencers across the UK. The idea of the charity show is to raise money for the Bold is Beautiful Project, which works with Refuge and Look Good Feel Better. Refuge work to empower the victims of domestic abuse to rebuild their lives, free from violence and fear, whilst providing a support network, services and a voice for the voiceless. Look Good Feel Better provide a network of support for, and to improve the self-esteem of, people undergoing cancer treatment through self-help, make-up and skin-care workshops. The Raise a Brow charity shop will be in residence in Covent Garden at 35-37 Neal Street until April 2 before moving to Dublin, Manchester and Glasgow. The pop up will be in London: 35-37 Neal St, WC2H 9PR – Fri 31 Mar – Sun 2 Apr, Dublin: 17 South William St – Wed 5 Apr – Sat 8 Apr, Manchester: Market Street, M1 1PT – Thu 13 Apr – Sat 15 Apr, Glasgow: St Enoch Shopping Centre, G1 4BW – Fri 21 Apr – Sun 23 Apr.